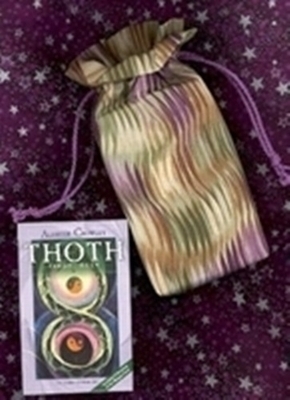 Double Draw Tarot Bags - Insights Double Draw Tarot Bag - Tarot Bags, Tarot Cards, Cloths, & More! If one could see channeled thought or energy, we imagine it would look something like the lovely metallic gold lines on this fabric. The undulating lines add great beauty to this multi-colored fabric. With a color scheme of cream, gold, sage, olive, plum, and lavender - this attractive bag will make an ideal home for cards that have some of the same colors in their borders or backside illustrations. Size: The Regency-style ruffled tarot bag is 7-1/2 x 5 x 1 inches. It fits most standard sized tarot decks that are up to 3-1/4 x 5-1/2 inches. There is an one-inch ruffle on top and an one-inch gusset (tote style) at the bottom. It is made of cotton and closes with two twisted cord drawstrings. Picture: The double draw bag is shown with a deck that matches it especially well. We keep our small size Crowley Thoth Tarot in this bag. The deck is not included.